For four hot, humid July days, 56 delegates of the Second Continental Congress gathered in Philadelphia with one purpose – to ratify the Declaration of Independence. The document, originally drafted by Thomas Jefferson with the help of Ben Franklin, John Adams, Roger Sherman, ad Robert Livingston, declared that the thirteen American colonies were now independent and free of the tyranny of the British Empire. On July 4th, with the final wording in place, it was ready for the whole world to read; though, it would be about another month before congress would actually sign it, contrary to popular belief. Even before any independence was declared or any articles were written, leaders of the colonies knew they were going to need a government in place immediately. Ben Franklin several times proposed documents establishing “intercolonial collaboration,” including during the Albany Congress in 1754. Out of fear of a centralized government due to their experience with the British Empire, colony leaders shot this proposal down. The suspicion of a centralized government became a theme in the Articles of Confederation that eventually led to its downfall and it’s replacement by the Constitution as the new nation’s governing document. 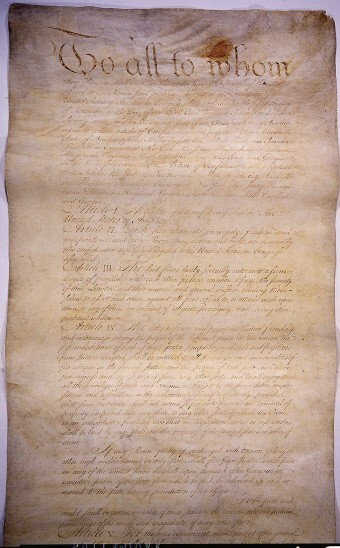 On July 12, 1776, a mere eight days after the adoption of the Declaration of Independence, a committee led by John Dickinson (former President of both Delaware and Pennsylvania) submitted a draft of the Articles of Confederation. Despite the need for speed, the Continental Congress took over a year to debate, rewrite, and fight over what should be in the document. Many in the Congress feared centralized government and having too much influence in the hands of too few. The power of each individual state become a hot button issue, plus how votes should be divided amongst the states. Many argued that states with larger populations (or ones that had given the most money to the national treasury) should have more votes, while others wished that each state be given one equal vote, no matter the size. 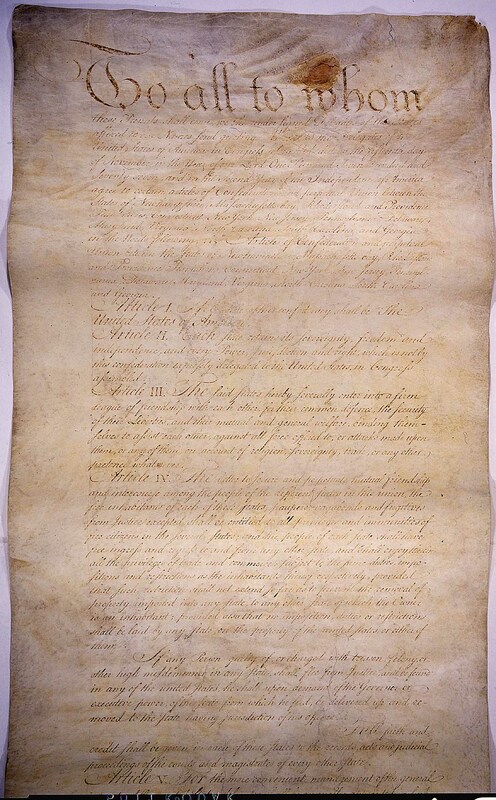 After settling on these issues, the final draft of Articles of Confederation was ready for ratification on November 15, 1777. It would not be completely ratified until 1781 (with Maryland finally signing off on it on February 22nd), but was used as the de facto system of government beginning in late 1777. The Articles of Confederation asked each state to “enter into a firm league of friendship with each other, for their common defense, the security of their liberties, and their mutual and general welfare,” but it was different from the Constitution in a few significant ways. Under the AOC, the national government consisted of only a one-house (unicameral) legislative branch. There were no executive (President) or judicial (Supreme Court) branches. Delegates to Congress were appointed by state legislatures, not voted upon by the public. Each state had only one vote, appeasing smaller states who feared that bigger states would hold more power in the newly formed country. Most significantly, though, any power that was not specifically granted in the Articles of Congress, was left to the individual states. It was no coincidence that slavery was not mentioned at all in the AOC. The law of slavery was left at the discretion of each individual state. The articles did allow for Congress to declare war, deal in foreign policy, print/coin money, run the military (though the troops must come from the states), and negotiate Native American affairs. To many citizens of the time, these were the most important issues that they expected their government to deal with, but the lack of a truly centralized national government began to take its toll. States regularly had conflicts with one another over commerce, varying business interests, and matters of state-run militia.There was no leadership, no one power source, to make determinations in these cases. Civil War amongst the states was a constant underlying threat. By 1790, with the help of James Madison, Alexander Hamilton, John Jay, Thomas Jefferson, and others of the original framers, every one of the original 13 states had signed off and ratified the United States Constitution, replacing the Articles of Confederation as the governing document in the United States. The framers of the Constitution had learned lessons, both good and bad, from the AOC: the need for a centralized and empowered national government, taxing as a source of income for the country, a checks and balances system, and the ability to create a document that could be amendable and changed as time necessitated it. For all it’s flaws, the Articles of Confederation gave the framers of the Constitution a blueprint to get it right the next time. Samuel Huntington was the first President of the Congress of the Confederation, the presiding officer of Congress. While it did not hold the same executive power that the President of the United States today does, it was quite an honor to be named as such. A signer of the Declaration of Independence and eventually governor of Connecticut, Huntington was well-respected among his peers. He was considered a “Patriot” for his acts of rebellion against the British Empire, though of course on the other side, a traitor. Due to his distinction as the first President of Congress, some historians have claimed that Samuel Huntington, not George Washington, should be considered the first President of the United States. You can’t both be right… I’ve always been taught the very first President of the United States in Congress (1774-1775) was Peyton Randolph.